In July 1958 an Austin Healey 100-Six (BN6) was quietly sent from the BMC production line to the Donald Healey Motor Company, where it disappeared until October of that year. During this three months time, all the chrome was removed from the car and Gold plated. The wheels were entirely disassembled and each spoke was gold plated. The black plastic knobs and steering wheel in the interior were replaced with Ivory. The seats we’re reupholstered in mink and Chinese kid. The car was beautifully painted in an off-white to complement the ivory. The first showing of this unique and beautiful car was at the 1958 Earls Court Motor Show, in London England. The Daily Express newspaper had financed the modifications of this car, as a very special advertisement for their newspaper. All attendees to the Earls Court Motor Show received a coupon within their program which might enable them to “win” this beautiful car at the end of the show. 1. In 1958 the winner sold “GOLDIE” almost immediately. 2. The car went to San Moritz, Switzerland where it was used during ski season. 3. The car was sold to a film star in England. 4. The car was resold and used as a daily driver. 5. In 1983 the car was offered for sale with 36,000 miles and had deteriorated but was still complete. 6. Later in 1983 the car was imported to Maryland and very carefully restored to the quality it was in 1958 by “Healey Surgeons”. 7. 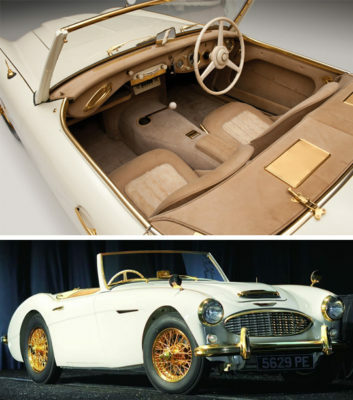 In 1986 “Goldie” was shown at the Cincinnati Austin Healey Conclave. 8. In 2013 the car is carefully dismantled and all parts cleaned, polished or re-gold-plated. 9. In 2014 “Goldie” won BEST OF SHOW at the Texas Concours. 10. 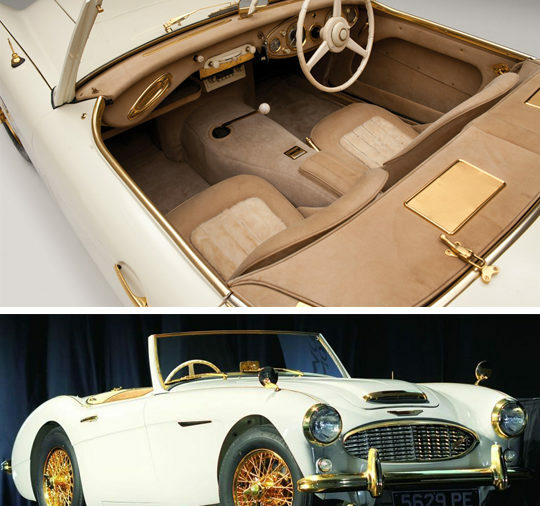 In 2015 “Goldie” won BEST RESTORED at the Kuwait Concours. This will be part of the 2016 Ault Park Concours d’Elegance Special Display of The Cars of Donald Healey which will also include a rare Healey Speedboat, Nash-Healey #1, Healey Silverstone and a WSW.